Wednesday night the C&G family raised our glasses to the end of a very successful three week vacation traveling through England, Scotland, and Ireland. This gorgeously pink glass of bubbliness was just the thing to take my mind off our adventures coming to an end (and the packing for home that still needed to be done). 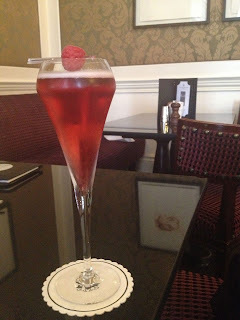 We sat in the elegant bar of the Shelbourne Hotel in Dublin not quite believing we'd be heading for home the next day. In Mr. C&Gs glass was an Irish version of the Manhattan (Irish whisky standing in for rye) and the boys toasted with their usual orange/strawberry fancy cocktails. The No. 27 Bar at the Shelbourne has a very extensive cocktail list, with many award winning recipes. But after ordering one of their specialty cocktails and having it arrive in quite possibly the smallest champagne glass I've ever seen (and paying $17USD for it), I learned my lesson and stuck with my new favorite glass of pink bubbly. We arrived home safe and sound yesterday, and there's a ridiculous amount of catching up to do, not to mention suitcases full of laundry. The four of us will battle through the next few days in a jet lag induced haze (waking at 4:30 this morning didn't help), and I hope to be back to blogging business by Monday. Although if I can keep on UK time for a few more days, I have the perfect excuse for starting cocktail hour right after lunch. Pardon me while I go open the bottle of rose chilling in the wine fridge. Cheers!